The Florida and Western North Carolina Conferences begin a two week Vision trip to South Africa on Monday, March 24. Three Florida Conference representatives will make the trek with three from WNCC. Jaylynn Byassee, Missions Pathways director for the WNC Conference, contacted me about a possible trip to South Africa bringing leaders from our Conference on a joint venture to deepen relationships with the Methodist Church of Southern Africa,” said Clarke Campbell- Evans, director of Missional Engagement for Florida. “We are very excited to be a part of this sojourn of learning and exploration. Brett Opalinski, pastor of Christ Church United Methodist in Ft. Lauderdale, and Paola Ferro, college senior at Florida International University in Miami and active in that campus ministry, are also part of the Florida contingent. According to Byassee, the Vision trip was born out of a desire to connect her conference in a global fashion in new and innovative ways, in mission in partnerships for ministry around the world. “With the teachings of Dr. Peter Storey during my divinity school days, I have always had a desire to learn more about this incredible country,” said Byassee. “As plans unfolded, it became clear that working side-by-side with another conference would only enhance our capacity for ministry. The team members plan on blogging about the trip. 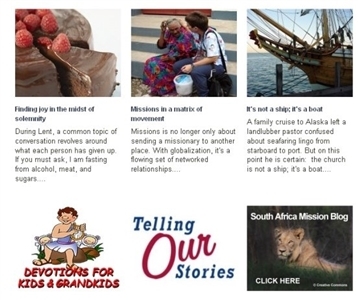 Click on the lion graphic on the bottom left-had corner of the home page to read about their experiences. (The South Africa quick link rotates with the Instagram link.) Click here if you’d like to subscribe to the blog.